Forum Index - Important - The 11th Vanilla Level Design Contest - [FAN JUDGE] ECS' Fan Judging Experience! We have 2 more reviews on the way! I literally didn't see any changes made, i even looked at Lunar Magic, so my previous review is still valid for this level. This level had quite a few changes! So it's the first one that will be getting a re-review! It's coming on the next post! Now let's go to today's reviews! This is a pretty cool level! I like the platforming in it, there’s a lot of variety and it keeps the level pretty engaging! It’s very fun to play, and flows pretty well! I really like the use of the terrain in this level! It makes a great use of extended level height! And i like the fact that you used a horizontal level as if it was a vertical one! There is a nice focus on vertical platforming and climbing in this level, and it has a great variety in the platforming, platform formations and climbing setups that makes it very engaging and enjoyable! 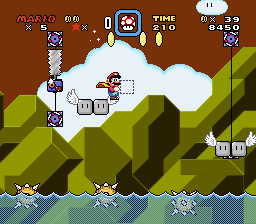 It also has some great exploration elements with the Yoshi Coins and a few coin blocks, though a few Yoshi Coins felt too simple: while the first two had alternate paths for them, the others pretty much only required an extra jump. The use of sprites is pretty good! It has a nice variety of sprites and some pretty interesting setups with them! The sprites really help making the level engaging! The Dry Bones bouncing setups are pretty cool! It’s quite a nice idea! 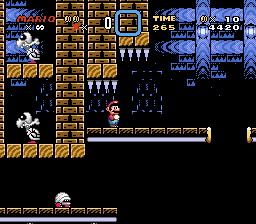 But most of them can be skipped by doing a running jump, since you put a higher block in most of them (which wasn’t needed at all, as Dry Bones will already stay on ledges). I also like the way you used Sparkys! They always felt pretty interesting and threatening! My favorite setups are these platform formations! They remind me of setups in Super Mario Bros 2/Super Mario USA! However, i’d say the use of Dino Rhinos and Dino Torches felt a bit out of place, as the level uses mostly castle sprites. And they weren’t really too interesting, as they’re mostly just simple obstacles. In the beginning of the level they looked quite promising, as you designed around their jumping mechanics, but then it seems you completely forgot about that for the rest of the level. - The most noticeable one is this ledge, which is too high to reach. It requires Mario to have P-Speed, and even then the jump has to be quite precise. By looking at Lunar Magic, i noticed there is a Hothead in that platform, and we’re supposed to spin jump on it to reach the ledge. However, the Hothead can easily despawn when we go to the left side of the area, and since his spawn point is the left side of the platform, we can’t scroll it far enough for it to respawn. If you had placed it in the right side of the platform instead, we would be able to respawn it. - This Goomba can fall on our head when we jump up here. - This Wooden Spike is quite hard to see as it hides behind the bush. - Here we can get up to this Rope platform by using the Goomba to do a “Goomba jump”. This allows us to get the Midway Point without having to go through the pipe, skipping the entire Subroom on level 25. This level has a few nice ideas! The first thing i could say i really liked is how well you used extended level height! This level has a great vertical oriented platforming! 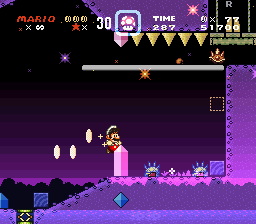 The idea of bouncing on Dry Bones is quite good as well, though the execution wasn’t the best, and many jumps can be skipped. As for setups, there are a few pretty interesting ones! The setups with Sparkys were particularly cool! A few Dry Bones setups are pretty good as well! Some platform climbing segments are also really cool! This level also has a nice amount of aesthetic creativity! It has a great theme! And i love the buildings made with Castle and Ghost House tilesets! I really like the way you used graphics! The tileset mix was really well done! I love the buildings you made with the Castle and Ghost House tiles! The decorations were also used nicely! The palettes look mostly good! I really like how you made them work for the buildings! The only palettes i don’t like are the purple ones for the Castle Stone Blocks, especially the skinny ones. The Layer 2 BG is good, though the Layer 3 clouds are way too bright due to the translucent setting. They look plain white, and feel really weird! The song is really good! It’s pretty catchy, and fits the level pretty well! I didn’t find any aesthetic issues, the only nitpick i could mention is some Castle Stone Blocks look strange having no corner tiles. Uh, this level is just really random! The design is all over the place, and it doesn’t have any focus at all! The level barely tries to execute any ideas it presents. Note that i won’t be saying many good things about it, so sorry in advance for being quite harsh. There are a lot of different ideas and gameplay styles mixed together, wall-running, platforming, bouncing on enemies, vines, flying, but none of them were really executed well, it seems like they were just thrown into the editor with no thought put into them! The design is all over the place, the terrain is mostly made of random flat platforms, and while it does have a bit of variety thanks to the different ideas used, it really isn’t interesting. The use of sprites is actually not completely bad, as there are a few setups that can be a little bit interesting, but for the most part it’s purely Boo spam. If there’s one thing i could say i liked is the Yoshi Coin placement, it’s actually quite decent, and each Yoshi Coin has a pretty unique idea! The problem is that these ideas aren’t always well executed. 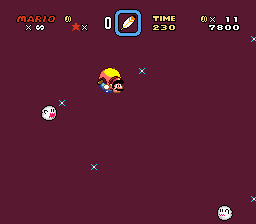 - The first one requires spin-jumping on Sparkys, and it’s quite interesting, though there’s a Boo off-screen above it that can hit us as the screen doesn’t scroll up. - The second is hidden on top of a ceiling, pretty simple, but there isn’t any issue with it. - The third requires us to lure Boo Blocks and use them as platforms. But the amount of Boos makes this segment really frustrating! - The fourth is my favorite! We have to drop into a Ghost house hole. - The fifth is blocked by an invisible block, but it’s quite trivial as we have the P-Switch active. There are also some very noticeable issues with this level! 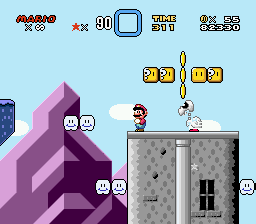 Other than the already mentioned Boo spam throughout the whole level, the last 2 sections are quite flawed. - The P-Switch section has a few blind jumps, as we can’t see the rows of blocks below. Also, this section uses the bottom row, which isn’t visible to the player! And it's made of P-Switch Blocks, so it disappears if the P-Switch runs out! - The flying section is just really random and uninteresting! It’s simply a completely open area with a lot of Boos spammed everywhere! There’s no defined path to take on it, and it’s really easy to just run into a Boo while we’re flying, which interrupts our flight and we fall on the Bottomless pit! Also, it’s possible to completely bypass this area by going over the ceiling where we grab the P-Switch and then flying above the screen until the end. Overall it’s a really uninteresting level that seems like everything was just randomly put into the editor. And it’s a shame, as the level actually presents a few interesting ideas! It could have been a lot better if you actually focused on developing those ideas. This is actually the best aspect of this level! It has a few quite interesting ideas used, especially when it comes to the Yoshi Coins! I like the idea of falling through a Ghost House Hole to reach a lower area! 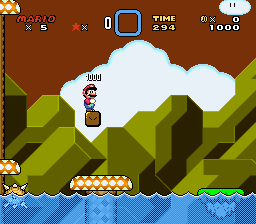 The idea of using Boo Blocks to climb is somewhat interesting as well, and so is the bouncing on Goombas on tile 1F0! However, the execution isn’t really well done, and the segments are really random, and this hurts this category. The level looks really empty, there are just a few platforms, no details, barely any decoration in it, and the BG is really empty as well! The graphics are vanilla, but they’re as simple as it can get. There are two bushes used as decoration in the beginning, but they feel out of place. The palettes don’t go well too, especially the back area color. And some choices are weird, like the Boo Block/Reflecting Boo Stream. The music is pretty good. Ok, finally got around to finishing some more reviews! It took quite long this time, as i was busy with a lot of stuff, ranging from college exams to internet problems. This post has 3 reviews, as i said before, as one of them is a re-review. This level had a few minor quality changes, which bring some small improvements to the level! However, i don't think these changes justify making a whole new review, as it would be pretty much the same with just 2 lines changes. Thank you for listening to my feedback PokerFace! I see this level had a few changes that addressed the issues i mentioned, removing the Thwimp in the garbage dispenser setup, as well as adding a reset door to the third Yoshi Coin Puzzle! It also had a "RUN" animation added in the Layer 2 sinking part which looks really cool! As for scoring, i'd say these changes could rise the Design Score from 56/60 to 57/60. This would make the overall score 94/100! Again, great job! I'll be checking other updated levels as i keep going, but i think this post took long enough to come already! This is a pretty simple level. It is quite an ok level in terms of design, but it is pretty uninteresting overall, it doesn’t really feel engaging. The level has an interesting idea, the use of Ghost House Holes, but it doesn’t execute it too well. The gimmick isn’t well explored in the level. 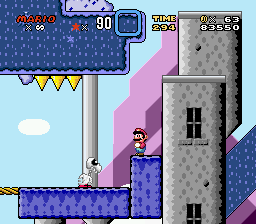 In the beginning it looks promising, with the Yoshi Coin requiring us to actually fall into the Ghost House Hole, but it never really takes off. The setups don’t grow in complexity, they stay really simple, and what’s worse, most of them just use Ghost House Holes as simple obstacles in the ground you should avoid, which is kinda disappointing considering the beginning setup is pretty creative with it requiring the player to actually fall into the Hole. I expected to see some more creative uses of the Ghost House Hole. You could have experimented more with them, and actually used them in the design instead of just making them something you have to avoid. A few examples could be a setup where we have to fall through the Hole into a moving platform, so we’d have to time it, or using the Hole in a spike floor, so we have to aim for the Hole to get through it. You could certainly have used the Hole’s properties of making tiles passable from above in more creative ways. Also, i think you could have used some more exploration elements, especially for the collectibles, because right now they’re mostly too simple to be interesting. The Yoshi Coins have some nice setups, especially the first and fifth ones, but they’re a bit too simple, especially since some are very similar. And you also handed a lot of Moons for free, 3-UP Moons should be a somewhat rare and hard to find/get collectible. The use of sprites is actually quite decent, but at the same time uninteresting. 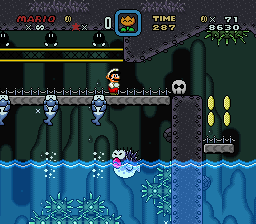 The sprite placement is good, you made a nice use of their properties, like Dry Bones placed in ledges, and there are a few interesting setups, my favorites being the ones with Bone Throwing Dry Bones in walls. However, at the same time they’re uninteresting simply because most of them can be easily avoided or bypassed, and they don’t feel threatening or make the level engaging. As for gameplay issues, i only found one, but it’s a really major issue! If we die and restart from the Midway Entrance, the camera position will be 2 tiles higher, and since the level has no vertical scroll, it stays like that for the rest of the level! This makes the 2 bottom rows invisible to the player, which includes most ground ledges we have to go through! This level has a pretty nice gimmick to work with, but it doesn’t execute it well. 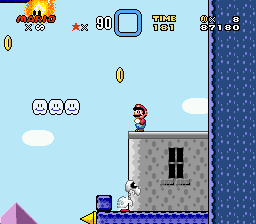 The use of the Ghost House Hole was mostly too basic in the level to be interesting. Also, when i saw the beginning of the level, i thought it would be a vertical level, and i think it could have been pretty cool to have the level a bit more vertical focused (maybe not a vertical level, but having extended height, for example), and it would fit the gimmick, since the Hole’s main use is falling. Sprite setups had a few interesting ideas too, though most don’t feel engaging as they can be easily avoided. The only ones i liked are the first Yoshi Coin, using the Hole to drop down, this setup with the Dry Bones keeping us busy while we wait for the Hole and the fifth Yoshi Coin with the use of Dry Bones. Not a fan of how this level looks. The graphics are fine, vanilla Ghost House tileset, the way everything is set up is simple, but good. The palettes on the other hand really aren’t good! Most palettes are just way too dark, some being pretty much black, and as such are really hard to see! The BG suffers the most from this, as it is only partially visible, and the objects look incomplete. The FG also has a few black palettes that blend with the black in the BG. And even a few lighter palettes, like the pipes, look weird. The song is kinda fitting to the level’s atmosphere. Also, i didn’t find any aesthetic issues, though a few objects look cutoff due to the black palettes. This level is kind of a mixed bag. It has some cool ideas, and executes them very nicely! It also has some cool setups and some pretty enjoyable segments! However, at the same time it has some very questionable sections, as well as a lot of minor issues that really bring the level down! In general, i really like the use of terrain in this level! There’s a lot of variety, some climbing sections, some platforming ones, some line-guided segments, and it makes a nice use of extended level height! The use of sprites is also pretty nice overall! It makes the level quite engaging, and there are some really clever setups! Especially the ones related to the gimmicks! This is a great platforming section, it has quite some variety in gameplay, but the sections go quite well together! I like the use of extended level height in this section! It allows for some great exploration elements, with some branching paths and such, as well as some nice vertical-like segments mixed with the horizontal platforming! 00 - 01: This section has quite some nice exploration bits already with the lower and upper areas, as well as the collectibles! I also like how you used the Chuck to introduce the level’s gimmick! There is one problem with it though! In order to get the Spring in the upper area, we need to babysit the Shell from the Koopa all the way up there! And there’s no way to know we need the Shell beforehand, so if we kill the Koopa, we can’t get the Spring! You could have placed a Koopa near the place where we need to use the Shell, to avoid item babysitting. 02 - 03: A nice segment with some bouncing on enemies on 1F0, as well as a quite nice line-guided segment! I like how you made it so missing the On/Off Switch doesn’t kill us! 04 - 06: This is a pretty cool section with a lot of exploration! I really like the use of branching paths! Also like your use of Piranha Plants! 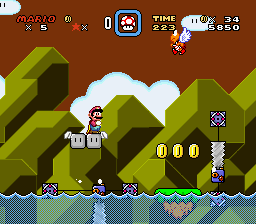 And screen 06 specifically has some really cool vertical-like sections, with the Mushroom Platforms and the ledge climbing with Shell kickers! There are a few problems i could mention though, the route to the third Yoshi Coin is a 1-tile gap, so we need to duck slide in if Big. Also, this jump can be somewhat tight, it’s easy to land on the platform above when trying to jump into the Thwimps, not a big deal, but would be nice to have more space in these kinds of jumps. 07 - 0A: Another great use of branching paths for exploration! 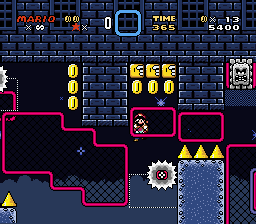 This section is very simple gameplay-wise, but i like the little bonus area with power-ups, and how we can pick different prizes! There is a pretty big problem in this section however! It’s possible to get softlocked when going for the bonus path! 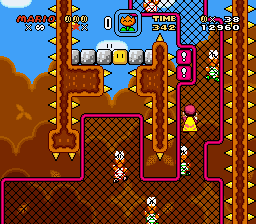 Basically, the two Para-Koopas in this section are placed in a very unfair way, as they fall directly into the gap with the Turn Blocks! So if we go for the gap right away, we might get surprised with a Para-Koopa falling there! And if we get hit, we can’t destroy the other Turn Blocks! 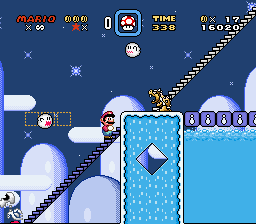 And we can’t get back up either because the ledge is too high, so the only way to get out would be bouncing on the Para-Koopa, but if we kill it (which i did instinctively), we’re softlocked! Also, this segment with the Wiggler is a bit tight being only 2 tiles high, we need to duck jump into the Wiggler if we're Big Mario! 0B - 0C: A nice and simple Midway section! It’s a pretty chill section for us to get the Midway gate, but it also has one of my favorite setups in the level, the setup with Koopas on 1F0 on screen 0C! The use of Piranhas is nice as well! 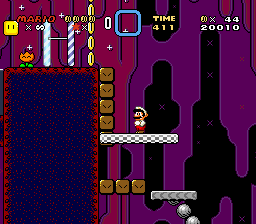 0D - 11: This section has a nice idea, but unfortunately it’s the worst section in this level due to many reasons. This line-guided segment is particularly longer than the previous ones, which makes it feel pretty slow. And this is aggravated by the fact that we have to go through it at least two times, if we do it perfectly. It’s at least nice that you made it so we don’t instantly die if we use the wrong On/Off Switch. Also, going in a more technical analysis of your On/Off solution, i don’t really think you choose a good order for it, and i’ll explain why. Basically, the solutions are: for the Key, leave everything OFF, and for the pipe, leave everything ON. And while these might sound good in theory, they are not good solutions at all! Leaving everything OFF means hitting only 1 Switch, while leaving everything ON means hitting no Switches at all! And, when coming blind to a segment like this, it’s very unlikely that the player will try leaving everything ON or OFF! The first instinct is trying a combination of these! And even more, the first instinct is trying to hit every Switch you see, which would lead to multiple fails before finding the solution! This room has a nice idea with the Key puzzle! And in fact it’s quite well executed! It’s nice how you set up the puzzle! Also, i don’t like how there are 3 Thwimps in the setup at the end of the room, i died a few times there because i got hit by one of them while spin-jumping on the other (since their jump timings aren’t aligned). There’s also a technical issue specific to setups where we have to bounce on a Thwimp before and during its jump. Basically, a Thwimp rises faster than Mario on a jump, so, depending on the timing, it’s possible for Mario to bounce on a Thwimp, and then the Thwimp catch Mario mid-jump and hurt him! This is a nice platforming section with some pretty clever setups! It is mostly quite basic in terms of platforming, though it has some pretty interesting setups with Dolphins and Thwimps! There’s also a cool little puzzle with the Rainbow Shell at the end! Overall it’s a pretty enjoyable section! There are just a few issues i want to mention here: I don’t really like the use of invisible blocks between these Questions Blocks, i actually got hurt in both these sections when i found these blocks, as i tried to jump up between the blocks. 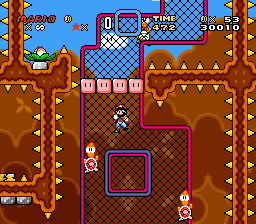 Also, the puzzle area with the Rainbow Shell is pretty annoying as Big Mario because of these 1-tile gaps! And the last room is a pretty nice and simple end room with a few enemies, and it has a really cool setup with the Thwimp, having it keep its momentum while on tile 1F0! Overall it’s a pretty cool level with a lot of clever ideas and interesting setups, and those are mostly well executed! But it also has some questionable decisions and a lot of small issues that bring it down quite a lot! This is the category where this level shines! The level has some pretty clever ideas, and those were well executed! There are a lot of interesting setups with Tile 1F0 in this level! My favorites are the one with the Para-Koopas on 1F0, the one with the Thwimp keeping its momentum on the last room, the one with the dolphins and Thwimps in the cave area and the puzzle with the Rainbow Shell! I could also mention the Key puzzle, as it’s well executed, despite having some flaws, as well as the many setups with spin-jumping on Thwimps, which were quite common, but each had their own twist. The Yoshi Coins are also very creative, as each of them has an alternate route with an interesting idea behind them! But some of them have quite a few flaws in the design. This level looks mostly good! I like the use of graphics! This level has a nice forest theme that’s executed pretty well! The decorations are mostly good, though i really don’t like the “half inserted” tiles used as decoration. I’m usually ok with tiles buried into the FG, but tiles sticking out of it don’t really look good in my opinion, especially because they’re passable, but look like solid tiles. The palettes are very pleasant! And so are the BGs! The one in the first area looks pretty nice! As for the reskins, i like the spikes using Urchin graphics! But i really don’t like the Bob-Omb reskin for the Thwimp, because its graphics don’t reflect its behavior! Bob-Ombs can be hit by a normal jump, while Thwimps hurt Mario! The songs are pretty good, and fit the level well! The main area one is pretty catchy! As for aesthetic issues, they’re mostly minor: there are some cutoffs in the corner tiles in the forest area, and some cloud tiles used as decoration have their inner pixels miscolored. This level didn’t change too much from the previous version, though i can see some definite improvements! Most of the changes were in the use of sprites, as well as a few tiny changes made to terrain stuff, and i can see most of them were made to fix issues i mentioned! So thanks for listening to my feedback! In general, the level didn’t change too much. The ideas are still the same, and the execution is mostly very similar to the previous version. Also, it’s still pretty frustrating to play! It feels pretty overwhelming and unforgiving at times, and some of the issues from the previous version are still present in the gameplay. Also, the level is pretty much as long as last time, which does add to the frustration. The gameplay and use of terrain is pretty much the same, there were only some tiny changes, which were definitely good! Some examples are some changes to Muncher placement, as well as some changes to the placement of Exclamation Blocks, which fixes the issues with blind jumps i mentioned last time! 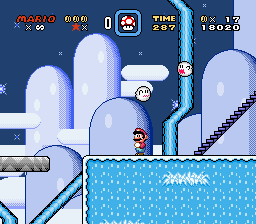 The platforming still feels a bit unfocused at times, with a lot of different ideas used that don’t go too well together, and the use of slopes along with ice physics can still be annoying at times! The length is also pretty much unaltered, it still feels too long, taking about 330 seconds to complete in a moderately optimized pace. And just like last time, the length adds to the frustration. 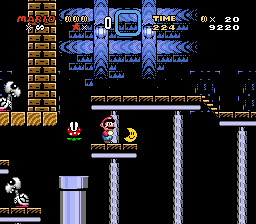 The second half still feels exaggerated with having to replay almost the whole level in the night section! It feels a bit uninteresting, since the level is mostly the same in both sections. The use of sprites is the most significant change in this new version! There were quite a lot of changes in sprite placement, even though most changes are pretty minor. Overall, these changes improve the level’s quality, and fixed some issues i previously mentioned. However, other changes are pretty questionable, and brought new issues to the table! - There were a lot of new line-guided segments added with Grinders and Fuzzballs, and those feel mostly pretty good! Most are an improvement from the previous verison! - The Boo Rings were removed, which is pretty nice! This improves the pace of the level, removing the need to wait in some sections (it’s especially nice here!). - You also removed the Flame Breathing Bowser Statues in the night segment when we go to the left, which fixes the issue i mentioned about the Flames staying on screen for too long! - While removing the Boo Rings was nice, i don’t think the Reflecting Boo Stream was the best replacement. My main issue with them is they feel really hard to avoid because of how well they blend with the terrain. Here for example, they completely cover the opening, and if we fall there it’s certain we get hit. And here, their movement is perfectly aligned with the stairs. - Similarly, while removing Flame Breathing Bowser Statues was nice, i really don’t like how you replaced them with Jumping Bowser Statues, as they’re placed on top of slopes, and can really surprise us when we’re going up! They were an issue before, and keep being one in this version! They still make for surprise element segments, and sometimes overwhelming ones with all the stuff around them! And this Bullet Bill is now even worse due to the Goombas being changed to a Grinder! - This Bowser Statue really gets in the way now that it’s placed in the edge of the platform! Not only it makes this jump tight, but sometimes we hit our head on it when jumping up! There wasn’t any significant change in terms of creativity, most changes were just minor sprite placements that really didn’t impact this category. The idea of the level still has a pretty interesting gimmick, but its execution isn’t all that interesting since the Exclamation Blocks didn’t make a big difference. The night section being really similar to the day section made it quite uninteresting as well, and there weren’t many interesting setups with sprites. The aesthetics are also mostly the same. The graphics are nice! With a good tileset mixing and a nice use of decoration! The palettes are also pretty good, and fitting to the level’s theme! The BGs were the only thing changed. The day section’s BG looks nice, though i think it’s a bit too clear, with a lot of white and a really clear light blue. The night section BG in the other hand looks really good! I love the palettes, and the stars really improved it! And the songs are pretty nice, and quite fitting to the theme! Oh my! It's been over a week since my last post here! I was just really busy this past week, so i had to put this thread on hold for a while. Last week was the exam week in college, and i shifted my focus towards that. Along with it, i also started to work on a new project, and i kinda wanted to get a head start before diving back into Fan-Judging. But here i am! I'll try to get back on track on these reviews and the next certainly won't take as long as these two took to come! Don't worry! Also, i didn't check for updated levels before posting this because this one already took long enough! So i'll get back to the updated levels on my next post! Without further ado, let's get to the reviews! Wow, this level is awesome! It’s really fun to play! Levels using Climbing Nets are usually pretty slow, but this one flows really well and is very engaging to play! I really like the way this level executed its gimmick! The brambles are very well made! Their hitboxes are pretty accurate, and the design around them is really good! They give the level a dangerous and at the same time calm feeling, similar to how Donkey Kong 2 Brambles levels play! Also, the use of Climbing Nets is great! You used them in many varied ways that makes them fresh throughout the level! Be it climbing to avoid the brambles, enemy dodging/timing segments, combining them with vines or Springs, using Climbing Net Doors to go behind some Blocks, there are a lot of really interesting uses for these nets! Also, this level makes a great use of Conveyor Belts, despite those being pretty slow, they were well incorporated into the gameplay to spice up the platforming of the level! I love the use of the terrain in this level! It makes a really great use of extended level height! The level dimensions were really put to great use, having this level being box shaped allowed it to focus on both horizontal and vertical design, which goes really well with the level’s theme and gameplay! It also has quite some focus on exploration! Having the level work with both horizontal and vertical design allowed it to have some pretty open areas, with quite a lot of non-linearity going on in each segment! There are always some small bits of exploration incorporated in each segment! The use of enemies is great! The enemies really compliment the gameplay, and make the level very engaging! There are a lot of really clever setups done with sprites! The most interesting ones were the Net Koopas, they were used in varied ways that always made them a threat! The Lotus Plants were also used nicely to compliment the climbing segments in the level! The level takes a while to beat, but i wouldn’t really say the length is an issue. It takes around 300 seconds to beat in a moderate pace, which is a pretty acceptable length. Also, the pacing of the level is really well made, and it remains interesting throughout its duration, so it doesn’t feel tiring! This level has a pretty creative gimmick, and the execution is superb! The use of Climbing Nets was incredibly interesting in this level, especially combined with the Brambles! There were a lot of really interesting segments made with these! And the great use of extended level height and level dimensions certainly compliments the design! The use of Climbing Net Doors to get behind the blocks is also really clever, and made for some pretty interesting setups! And the use of Conveyor Belts is also pretty interesting! There are also a lot of clever setups using sprites! The Net Koopas were used in many interesting ways! And the Lotus Plants also had some pretty nice setups! Also, the level’s theme is great! It’s really well executed, and goes really well with the design! It has a great theme! And it has been executed really well! The brambles graphics look great! The decorations used were also pretty cool! I’m usually neutral towards half-buried tiles, but i have to mention them here because this level made a great use of them! It’s nice how you gave them a purpose, marking safe ground tiles! The palettes are beautiful! They are very pleasant to look at, and compliment the visuals really well! I like the autumn feel the palettes give to the level! Also, i love the ambience you created in this level! It manages to capture the feel of a Donkey Kong Country 2 brambles level pretty well, feeling dangerous, and at the same time calm and peaceful! And the song certainly contributes to that! Important: Your level doesn't use the VLDC 11 Base ROM! It will be disqualified because of this! This is a pretty basic and uninteresting tide level. The design is overall pretty basic and straight-forward, and it doesn’t really try to be too engaging. There isn’t really much variety in the way the level plays, and it’s mostly just a flat tide level with a few platforms scattered around. 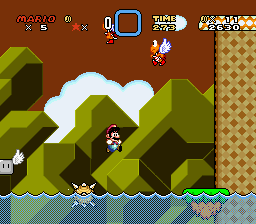 This also leads to a problem with the pacing, as pretty often the level is played in the water, and since the water pushes the player back, the gameplay becomes very slow! This can make it feel boring at times. 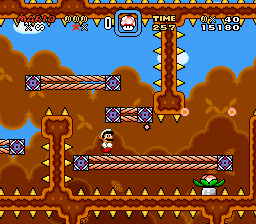 The level does have a few exploration bits, with a few elevated platforms, as well as Yoshi Coins and a 3-UP Moon, but these aren’t too interesting as well, and become kinda repetitive after a while, as they’re mostly based on using Winged Platforms to reach elevated platforms. The use of sprites is pretty unfocused, and kinda random at times. The level uses a wide variety of sprites, but doesn’t really focus on any of them, and they don’t go too well together. It also doesn’t try to do anything interesting with the sprites, they’re all used in very basic and traditional ways, and the setups are very similar, which makes it very repetitive overall. 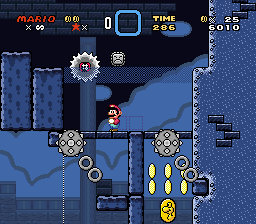 There are even sections that consist of the same setup repeated for 2-3 screens straight, such as this section with just water and Floating Spike Balls, or this one with Spike Balls and Line-Guided Chainsaws. Also, i’m not really a fan of the Jumping Fish Generator used at the end of the first half! The difficulty curve is also pretty random, being flat in terms of design means the level’s difficulty comes solely from the sprites, and those don’t really have much consistency. Some sections are very flat, and barely have any dangers around, and others are full of different types of sprites coming from all sides! - You used Blue Switch Blocks in your level, but you didn’t provide easy access to the Blue Switch Palace. - This Feather allows the player to easily fly over the whole second half of the level. - Using the Goal Gate on a vertical level messes up with the Bonus Game when we reach 100 Bonus Stars. The level doesn’t have much to show in terms of creativity, it’s pretty flat and straight forward, and really doesn’t do anything interesting. The use of sprites is very basic and repetitive, and none of the setups really stand out. The level does have some exploration with the Yoshi Coins and the 3-UP Moon, but their setups are pretty similar, and they feel kinda repetitive. The graphics are purely vanilla, they were used in traditional ways, and pretty decently! The palettes are pretty good! The FG palettes are nice, and BG ones look great! The only choice i don’t like too much is the Back Area Color. The dark underwater part at the end looks good as well. The music choice is quite good! There are no glitches or aesthetic issues, the level is quite polished visually! Oh my gosh, thanks for the glowing review and favouriting the level too. I'm really happy you enjoyed it! Back here with two more reviews! These were quite big, as i went into some detail in them! Note that Skyway Sanctum's review came kinda negatively, but that doesn't mean i didn't like the level. In fact, it's a great level, i just went into detail on the issues as those were quite noticeable for me, especially because of how good the first half was. As for Chuck's Norris, well, this is one of those reviews where i kinda don't want to be harsh, but i go in detail with all the flaws i found in the level. As always, don't get discouraged by this review, my intention with it is allowing you to notice what you did wrong and improve on those aspects! Also, i went back to a few levels and did some tiny adjustments to their scores, mostly for consistency again. This one had quite a few changes, so i'll be doing a re-review of it! Also, i'm still trying to decide what to do with levels like Metallic Metropolis and Altair, as they had some changes i want to comment on, but they aren't major enough to justify a new review, so i might change the way some re-reviews work. This is a pretty cool level! But unfortunately, i have some mixed feelings about it. The level is pretty well made, it’s very engaging, the flow is mostly really good, and it can be pretty fun to play! However, the design quality can vary quite a bit, most notably between the first and second half, and this brought this level down a bit in the end. This level has a lot of creative gimmicks, and the execution is mostly quite good! The use of tile 1F0 is really nice, and so is the use of Climbing Net Doors to go behind enemies! There are some pretty interesting setups with these gimmicks, and it’s especially cool how they get mixed later in the level! It is a pretty challenging level, but in a good way! The difficulty is mostly fair, and the obstacles are well made and make the level very engaging! The level also uses Blue Switch Blocks to make many setups easier for people who don’t want to have a hard time with the level, which is great! However, it does have some noticeable difficulty spikes, and those can make the level pretty frustrating! Another thing that can add to the frustration is the length, as the level is quite long! It took about 290 seconds for a run with all 5 Yoshi Coins, and despite not being as long as some other levels i’ve reviewed, it does feel a bit tiring! Since the quality of each part varies quite a bit, i’ll be going through each of them separately. My favorite room in the level! This area does a wonderful job with introducing all the gimmicks used i the level! The learning curve is great! The level starts with very simple setups, and these grow in complexity as we progress! The first Thwomp already does a great job introducing the use of tile 1F0, and the Message Box compliments it with an explanation! The next setups have a nice platforming while expanding on the 1F0 concept. Then we get introduced to the Climbing Net Doors with a pretty simple setup that shows how we can go behind enemies! After this, the level continues with developing each gimmick, expanding on new setups with them. 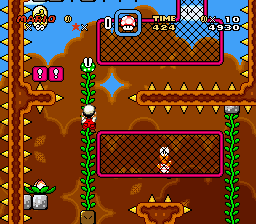 The first Yoshi Coin is particularly clever, mixing tile 1F0 with Climbing Net Door in a pretty cool way! It’s also nice how there’s a ledge to prevent us from falling on the Grinder! The rest of this section is pretty simple, and it’s nice how it introduces the reskinned Falling Spike for the next area. The only thing i don’t like is this Thwomp. As we come from below, the screen takes a while to scroll up to it, and we can get hit before noticing it is there! This room starts pretty impressive! After having the gimmicks introduced in the first room, this section does a wonderful job with further developing them! Mixing the gimmicks already seen with Scrolling Layer 2 was really clever! The first setups are quite simple, and use the idea of spin-jumping nicely! Then comes the one with the Climbing Nets, which is really well made with the nets being connected by the scrolling ones! Then this is the point where the quality of the level starts ‘decreasing’, and it already starts with this Climbing setup… In the end of this setup, there’s this Thwomp, which can only be passed by staying behind the Net (which is more complicated than the normal way), so you’d think there’s some kind of secret hidden behind it. But there’s nothing! 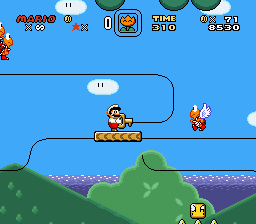 The pipe is where we come from when restarting from the Midway and the block contains a power-up. In fact, coming up here makes us miss the Midway Point! So i don’t really see a point to this Thwomp, in fact, it just feels misleading! The line-guided setup is fine, but be careful with using the bottom row, as it isn’t visible to the player. Then we come to a very questionable setup, it’s a 3 screen segment where all we do is spin-jump on Thwomps and a Ball and Chain. Despite making use of the Layer 2 Scrolling and 1F0, this segment feels pretty filler, as it’s repetitive. It’s also pretty hard compared to what we’ve seen in the level so far, and that, along with the fact that it’s quite slow, as we have to wait for the Layer 2, makes it really frustrating to have to replay this segment every time we restart from the Midway! 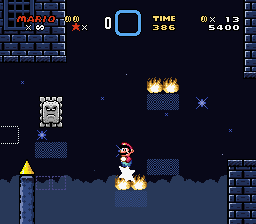 Also, the Bowser Statues don’t add much to the setup, and we can ‘break’ this segment by spin-jumping on the Flames instead of the Thwomps (though this isn’t really easier than using the Thwomps). I expected to see some more Climbing Net setups in this area, as those go really well with Scrolling Layer 2! This room gets back to the vertical oriented progression of the first one, but it does seem to lose the focus a bit when compared to the previous rooms, and doesn’t develop the gimmicks much further. It starts with some nice bits of platforming, there is the use of some simple spin-jumping setups again, this room also uses Thwimps quite a lot as well, and while most are pretty fine, some can be problematic. The first setup with Thwimps on 1F0 is a pretty questionable one already. This segment uses window tiles as a ledge, which doesn’t really look solid at first (especially because there’s a decorative window using the same tiles right above it! ), so at first i thought i had to spin jump on the Thwimps. And after i discovered i didn’t, this setup felt a bit weird, especially with the disposition of the tiles 1F0. The next sections are pretty nice, and they feature a few better uses of tile 1F0 with Thwimps being a bigger threat! There’s also the fourth Yoshi Coin which is quite nice, though i’d say it feels easier than the intended route. 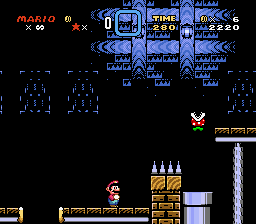 (And when playing for the first time, the player might kill the Koopa before knowing he has to keep the Shell, making him unable to get the Yoshi Coin) Also, a minor issue, but this Thwimp gets stuck up here after jumping twice. As for the next segment, it’s an interesting way to get the Key, though it’s pretty annoying how sometimes the Thwimp can kill the Shell! And using the Key for the fifth Yoshi Coin is quite clever! The rest of this section is pretty fine, though there isn’t any interesting use of the gimmicks. Overall this is a great level, but it suffers a bit from loss of focus near the end. The design around the gimmicks decreases in quality from that point onwards, and some setups don’t seem like they have much purpose. I’d say this level would have benefited from having a few parts cut out (the questionable setups in the second and third rooms come to mind), not only because that would help with the length issue, but also because the development of ideas seems to peak midway through the level, and decreases afterwards. This is the category this level shines! It has some very interesting gimmicks and ideas! The use of Tile 1F0 was really interesting throughout the level, and so is the use of Climbing Net Doors to go behind enemies! And combining both of them with Scrolling Layer 2 was really clever! There are tons of interesting setups in this level, and the gimmicks were executed mostly pretty well! However, there is a noticeable loss of focus near the end of the level, and the gimmicks aren’t too well executed after that point, which hurts this category a bit. This level looks pretty good! I like the tileset mix you did with Underground, Castle and Ghost House tiles! The “buildings” and FG formations look good! The decorations are also great! I really like the use of windows, brick walls and pillars! The BGs look great! I like the building BG used in the main level! The Star BG in the Layer 2 section looks great as well! The palettes are pretty pleasing, and create a nice atmosphere! And the song is pretty good, though sometimes it feels a bit too calm for the action going in the level. (1) Important: The download link to your BPS in the Rules and Submissions thread is broken! I had to download your level through your Files to play it. 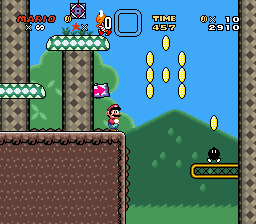 (2) Important: Your BPS patch was made with the VLDC11 Base ROM instead of a clean SMW ROM! This means we get an error when patching it to a clean ROM, and have to use the VLDC11 Base ROM to patch it! (3) Important: Your entry uses more than 1 Map16 page for FG! I'm not exactly sure if the first two issues are reasons for disqualification, but this third one certainly is! This is a pretty weird level. It has a few somewhat decent ideas, but it has a lot of design flaws! The difficulty is also pretty inconsistent, and the level can be easily broken in many ways! The design has a lot of questionable decisions, many sections have unfair setups and nonsense obstacles. The level really doesn’t seem to have a focus, despite having a gimmick to work with. 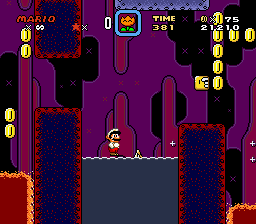 The difficulty is also very inconsistent, it’s all over the place, and it seems sometimes the level can’t decide if it wants to be a normal level or a kaizo level. 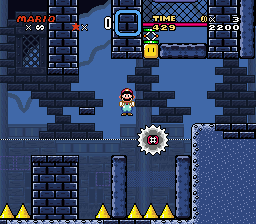 Also, there are a lot of oversights with breaks in this level, and it can be completely broken very easily! Right off the bat we start with a ‘kaizo trap’: a Swooper ready to hit us, along with a Bouncin’ Chuck ready to jump! Then we come to a section that requires P-Switch babysitting. Also, where we find the P-Switch there’s a useless Vine blocked by Used Blocks, so the player might think he needs to use the P-Switch here, wasting it and being unable to progress in the level! The section with Falling Platforms is quite nice! And the P-Switch run is nothing special… until we reach the end. Here we find a blind jump, and there’s an Arrow Sign pointing to the left, when we actually need to go to the right! Now we get to the first tile behavior change, out of nowhere, the lava decided to act like Munchers! (The lava to the right of the pipe is still lava though) Other than the weird tile behavior, the next section is a mostly fine platforming over “Munchers”. And here we have our first and biggest break in the entire level: We’re supposed to ditch Yoshi to reach the ledge to the left, but you put a Blue Shell here (the Shell Kicker kicks it into the pit, but we can respawn it), which allows Yoshi to fly, and with this we can take him into the whole rest of the level! (We could also jump off the Swooper to reach the ledge with Yoshi anyways) And, since every room has at least one Disco Shell, we can use Yoshi to fly over the whole level! Also, this pipe has lava over it that acts like lava surface, so if we jump on it we get pushed into the wall and die! This room starts with some more tile behavior changes, though this time it’s not a bad one! The previous room had a Message Box saying that “The Flower will protect you” and this room puts us directly into the lava, which behaves like water. So it makes sense! Then we have another P-Switch run, which is fine, and we get to the Midway. Now, here there’s another problematic tile behavior, this water tile acts like lava! This wasn’t an intuitive change, and can be very punishing! Especially because the “NO” made of coins appears as used blocks because of the P-Switch, so the player’s first instinct will be to swim below the blocks! You could have told about this in the Message Box, something like “The Flower protects you from lava, but water is deadly” would be enough. 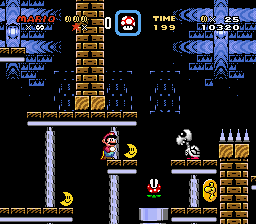 Then we have a Rotating Platform that reminds me of some kaizo setups, though it didn’t feel too hard to get through. However, sometimes a few random ground tiles will still act as ground! 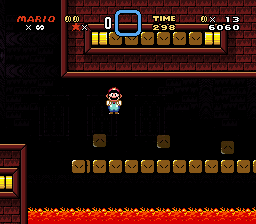 The lava also goes back to acting like lava, though there is a “NO” and an arrow made of coins to show that. 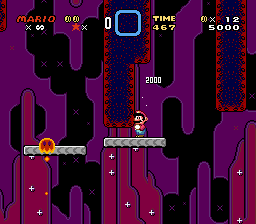 This next section has some jumps on Falling Platforms, which are pretty nice, as well as some exploration elements, including the presence of the 3-UP Moons in this level. There are also some random Thwomps that get stopped by tile 1F0. Then we get to another tile behavior change, except this one is really unfair and hasn’t been explained at all! These gray-ish platforms act like Climbing Nets, and they're placed right above lava! I went straight through them and into the lava below the first time i played this level! Next there are a few more nice Falling Platform jumps and some “platform swimming”. And then we come to the Star Run segment, and the lava decides to act as Munchers once again! This segment is actually mostly good. It does require a Cape to hit some blocks, but it also provides one in the beginning. Other than that, it’s a regular Star Run segment. And of course, this can also be completely broken by taking the Yoshi up to this point! Also, there’s an Exit-Enabled Pipe in the third room that leads to level 105, which is a barely edited version of vanilla level 105. 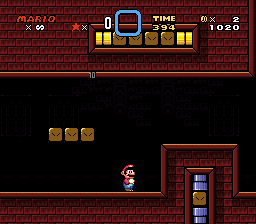 It only has a big invisible wall in the beginning with letters saying “Back to VLDC”, and we can use Cape + Yoshi to fly over the wall, so we can access the rest of level 105, which is unedited, except for some FG graphics having some random letter tiles. We can even complete the level through level 105’s Goal Gate! And entering the bonus room in level 105 takes us back to the second room of the VLDC level. This level has a few somewhat nice ideas with the different tile behaviors, and its base around a fairly known meme, but the execution is pretty flawed! It does have a few interesting setups like the Star Run and the Falling Platform setups, but overall it doesn’t have any focus, and nothing stands out much. It just doesn’t really look good! It has some fairly random graphic choices, especially due to the fact that part of the gimmick consists in tiles behaving differently than their look. The decorations are also weird, like the weirdly colored brick tiles used in the platforms. The palettes also don’t look good at all! Most things have a really weird mix of red and blue, and some objects just have very weird colors, like the bricks and the bone platforms. The song is pretty good, though it gets cut out pretty much every time there’s a sound effect playing! Also, this level has a lot of aesthetic issues! - There are lots of cutoffs everywhere in this level, such as the pipes used in the middle of something, like FG platforms or water, some lava tiles, especially when used along with pipes or some places where the water is used along with FG platforms. 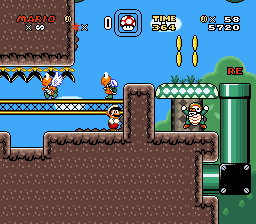 - There are some priority issues with a few tiles that have priority covering parts of Yoshi or dying enemies. - Some FG platforms have missing corner tiles. 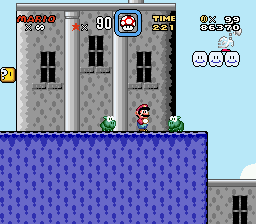 - Also, Yoshi has garbled tongue/throat/fireball graphics in the third room. Well, i'll keep going with these reviews, i don't know how much they'll be relevant after the official results come out, but i'm still willing to play through every level, and i'd say it's just fair to review them as well, not only to show my opinion, but also give feedback that might be useful for all the creators out there. As for Brown Block Factory, as i said in my review, just by the title i could already tell it was gonna be great, and i was really excited to try it! Even more when i saw Blind Devil's score for it! This time i slightly tweaked some creativity scores, as i think some early ones weren't as coherent based on how my scoring evolved as i progressed in the reviews. Oh my! This level is incredible! It’s really fun to play! It is a great puzzle-oriented level with a lot of unique ideas and tons of really clever setups! It also has some action-oriented segments, as well as some action going on with the puzzles, that makes it very engaging! The gimmicks used in the level are really creative, and their execution is really good! The Yoshi feeding segments feel pretty fresh and interesting, as their setups are really well made, and pretty unique! 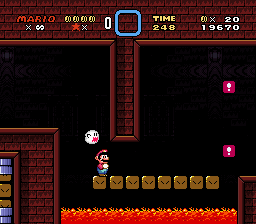 The fireball sections are probably the most unique parts of this level, as i have rarely seen Mario’s Fireballs being used in clever puzzles like this, even more in a vanilla level! 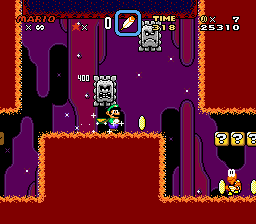 The level also makes a great use of its resources, having some really clever setups with tile 1F0, as well as a nice use of sprite, such as Bowser Statues and Thwimps! The first half is based on Yoshi feeding, and it does some really great setups with this! The section has a really nice learning curve, starting pretty simple and mostly on a safe environment, and then evolving in complexity and danger as we progress through! The second Yoshi feeding setup is very interesting with each enemy having a small puzzle by itself, my favorite being this Goomba! The third Yoshi is my favorite setup of this section! You made a really great use of Extended Level Height with this setup! And using water so the Yoshi falls slower was clever as well! This segment feels really good to play with the fast gameplay required to feed the Yoshi! This section also has some pretty clever action setups, like the use of Thwimps with Tile 1F0, or the use of Digging Chucks, or even some setups with Hammer Bros! 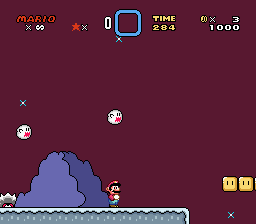 Also, the hidden 3-UP Moon was really clever! The second half has one of the most creative uses of Mario’s Fireballs i’ve ever seen in a level, let alone a vanilla one! The idea of using Fireballs along with tile 1F0 to kill sprites on the way is extremely clever! There are a lot of different puzzles that use the same idea, but play differently enough to be really fresh and interesting, from jumping on Springs to clearing the path for the Fireball, there are a lot of unique ideas here! My favorite setups are the one we have to create a path for the Fireball and the one we have to run and keep with the Fireballs! These are extremely fun to play! This section also has more interesting action setups, this time focused on Bowser Statues, and there are some pretty clever setups with them and tile 1F0! 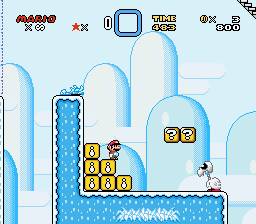 The level can be somewhat long, it took me about 270 seconds to complete on a full collectible run (5 Yoshi Coins + Moon) in a run without resets! Usually i’d say 270 seconds isn’t exactly an issue, and i still think it isn’t! But, due to the fact it is a puzzle level, the length can be problematic if the player messes up the setups a lot. This level does have some issues though! Most of them aren’t big issues, but still affect the experience to some degree, so i’ll mention them. I also have some nitpicks with a few sections. There are also a lot of possibilities to break puzzles in this level, some of which can break quite a lot of stuff in the level! - The Yoshi shows a blank message when it grows for the first time. - I really don’t like this setup with the Hammer Bro and the Thwimp! My problem is specifically with the Hammer Bro. Basically, since we come from above, the Hammer Bro isn’t visible at first, and when we see it, it is right about to hit us! This is hard to dodge even when we know he’s there! Also, depending on how we’re hit, the Yoshi might run straight to the water, and if we lose him, there’s no way to get another, and we’re forced to die and restart the level! - The Bony Beetles in the second half can blend a bit too well with the visuals, being a bit hard to see! - Also, some of the puzzles can feel a bit overwhelming with all the sprites around! Most notably this one, we have the Bowser Statue, the spiny and the other Statue shooting fire while we’re trying to hit blocks! - The last puzzle is just really weird! It seems to have a lot of minor issues and possible breaks, and overall the solution just feels weird! First, i’d say it’s a bit unintuitive, and, unlike the other puzzles, the solution isn’t too clear! 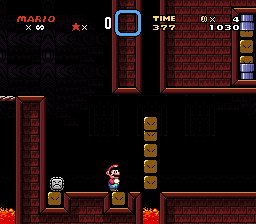 Also, the solution can feel a bit precise compared to the other puzzles in this area, having to ditch Yoshi and shoot a fireball in a pretty small time window. And failing it is particularly punishing, not only because we fall in a bottomless pit if we fail to reach the ledge, but it’s never clear we have to keep Yoshi, and if we proceed without him, it’s certain death in the spikes below! 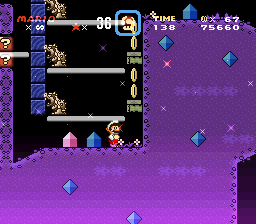 There’s also this section to get the Yoshi back, it’s entirely possible to Fireball one of the Spinies on accident and have to restart the whole puzzle because of this! 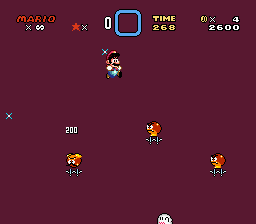 - In the second Yoshi feeding puzzle, it seems the Goombas respawn if Yoshi eats them offscreen, which allows us to feed Yoshi using just one Goomba. I don’t know if this is some sort of glitch. - If we don’t get hit, we can have a reserve Mushroom by the third Yoshi feeding puzzle, and we can just feed him the Mushroom, skipping the whole puzzle. - Due to the fact that the third Yoshi is a Blue Yoshi, we can eat a Shell and fly to the Midway Platform instead of ditching the Yoshi, which allows us to take him to the second half of the level! This can be done in two ways: We can feed the Yoshi the Reserve Mushroom and use any of the Shells in this area to fly, or do the segment normally while being small and take the Yoshi through the Reset Door, then take any Shell in this area. - With the Yoshi into the second half, we can break many of the puzzles! Here, we can eat the Spiny (though it’s tight to do so without getting hit by the spikes). Here, we can also eat the Spiny, but this is a lot easier to do. Here, we can easily eat the bottom spiny, and use Yoshi’s invincibility frames to fry the top one. With Yoshi, we can also eat most dangerous enemies around, including the Bowser Statues, making most segments easier! - Also, we can damage boost through a few of the puzzles in the second half (each “set” of puzzles can have its last puzzle bypassed by damage boosting, since after that we get a new Reset Door with a new Flower). But this is kinda in the nature of this kind of puzzle. - The last puzzle can be broken by spin-jumping on the Sparkys, since the Spiny’s coin will come to the left, and we’re able to collect it. This level is extremely creative! It has some incredibly clever and unique ideas, and their execution is really great! It has a lot of really clever setups with its gimmicks, and all of them are very memorable! The idea of using Yoshi feeding is something i’ve seen a lot, and this level still manages to come up with some pretty unique setups and a really good execution! The third Yoshi feeding setup using Extended Height was particularly clever! 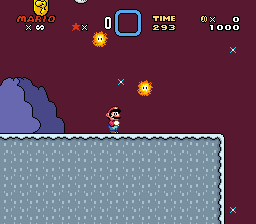 The Mario Fireball puzzles are probably one of the most unique uses of Fire Flower i’ve ever seen! It is really creative, and there are a lot of really clever and unique puzzles with it! The level also makes an excellent use of its resources! 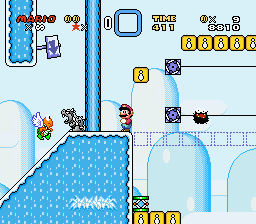 It has some really clever uses of Tile 1F0 to complement the puzzles, and also some really interesting setups with the sprites, most notably the Spinies, Thwimps, Digging Chucks and Bowser Statues! This level truly shows an impressive amount of creativity in everything it does, from the ideas, to the setups, to the execution and use of resources! And it deserves a full score! The graphics are really well done! The crystal graphics look beautiful! The terrain graphics are all really polished and well made, and the decorations used are great! Also, having the FG translucent compliments the crystal feel of the level! The BG is beautiful as well! The Star Sky looks really good, and the color gradient compliments it really well! It also shows pretty well due to the translucent FG! 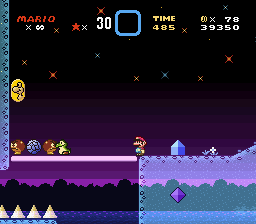 The palettes are really pleasing, and fit really well with the level’s theme! The song is really good! It gives a nice chill feeling to the level, and fits the theme really well! I found no aesthetic issues, though i’d say a few enemies blend into the visuals a bit too well due to the Translucent FG and their palettes. When i saw the title, i could already tell this was going to be great, and i was not disappointed! This level is really fun to play! It has a great platforming, which makes it very engaging, and incorporates some clever gimmicks and mini-puzzles into the gameplay! This level has a really interesting gimmick with the use of the Eating Block and Used Block related stuff! And the execution was really well done throughout the level! You not only used them for some block eating setups to open passages, but you also explored some of the Eating Block’s unusual interactions and behaviors! There are also some really clever setups such as the survival ones! The first section is made of mostly simple uses of the Eating Block gimmick, those are used mostly for opening passages through Used Block walls so we can keep going. This section has a great learning curve! It starts with a simple setup to introduce the gimmick, and then incorporates more enemies! It also has a great paltforming with climbing on ropes, jumping on Sinking Platforms over lava and avoiding enemies! It also introduces one of the more unusual behaviors of the Eating Block, and the ending survival section is pretty cool! The Pre-Midway puzzle is mind-blowing! I was really impressed with the “Off” blocks that can stop the Eating Block in place when touched! The puzzle in this section is simple, but really clever! The second section also has a great platforming, and it evolves a bit more from the first! I realy like the segments with having to avoid Eeries, or luring Boos out of the way before progressing! The Eating Block Bridge is pretty cool as well! I didn’t really find any kind of issue, the level is really polished! This level has a lot of creativity to show! Creative gimmick, unique ideas and mechanics, great execution, clever setups, it has it all! And as such, it deserves a full score! The Eating Block gimmick is really interesting, and it was developed really well! The level not only has a lot of great setups using Eating Blocks in “traditional” ways (that is, using them to eat a line of Used Blocks), but it also explores a lot of the Eating Block’s unusual behaviors, and uses them in really clever ways! 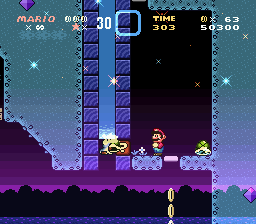 Also, this level has some clever uses of sprites, such as Eeries, Boos and Diggin’ Chucks! They are used in very interesting ways, and compliment the platforming and the gimmick really well! The graphics are well made! The main FG has a nice use of the brick and crate graphics! And the FG objects look good as well! I especially love the pipe and used block animations! The palettes are pleasing! They set a nice mood to the level! The Diggin’ Chuck rocks reskin is quite good, and fits the theme! The song is great, and contributes well to the level’s atmosphere! I didn’t find any aesthetic issues, but the only nitpick i have is the BG is way too dark! I know it sets a dark atmosphere to the level, but i’d still like it if it was just a bit brighter, as often it seems the level has no BG!